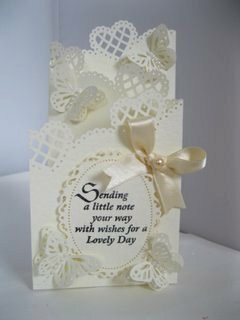 Having choices when you are making cards is what keeps the interest going and if that can happen from one particular fold then so much the better. Once you have the basic shape you may want to look at other ideas on what to do with it. Time now to grab that cuppa, sit back and relax as you watch this short video which will give you some new and different ways that you may like to try with your Tri-fold Cards. Make the card from two matching pieces of your cardstock for a lovely elegant look. 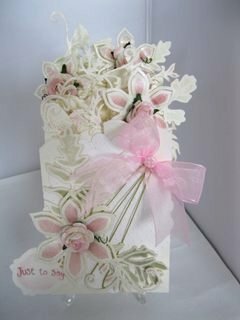 Paper punched, silk or Mulberry flowers all will make your creation special. 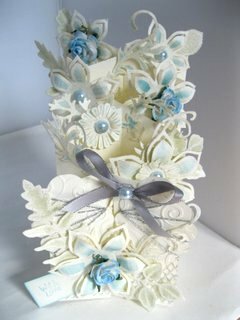 Or maybe you would like to try making your own, from ribbon or organza, and you will find several Tutorials for flower making that would all be suitable additions to the card. The effect is very pretty, and it is a very "girly" card. But because this is such a pretty effect then I hope you will give the Double Zig Zag card a try.